Spend two fabulous weeks cruising around California. 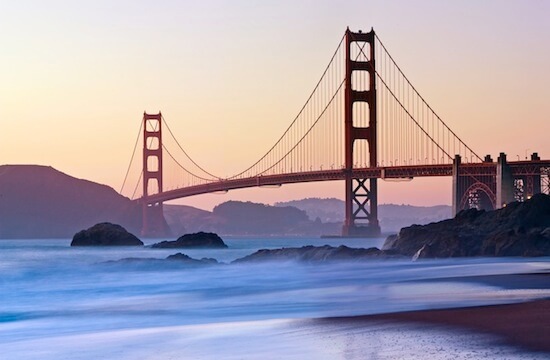 You’ll experience glorious coastline, enchanting forests, gigantic redwoods and one of America’s favourite cities. All of our trips include flights, hotels, car hire and a fab road trip pack. All of our American road trips can be tailored to meet your requirements. Do you have more or less than 14 days for your road trip? No problem, we can bolt on extra nights to allow more time to explore or shorten the number of destinations as required. Just let us know when requesting your quote. Thank you for the most amazing trip to California! Arrive in California, and take a taxi from the airport to find your hotel in the cosmopolitan city of San Francisco. Enjoy an evening meal in one of the city's excellent restaurants before settling in for the night, so you are ready and refreshed for two full days exploring in this wonderful city on the bay. Once the fog lifts, one of America’s favourite cities will be revealed. Ride a cable car, climb the streets and get into the vibe that only this city can offer. Full of Victorian charm, famous movie locations and wealthy tech companies, this city has it all. A second full day to explore San Fran’s must-see places which will be listed in your personalised Road Trip Pack. These “must see” places include Coit Tower, Lombard Street, the Painted Ladies, Union Square and Alcatraz to name just a few. Whilst you’re in San Francisco you simply must experience some of the best Chinese food in the world, thanks to the large Chinese community that call this city home. Monterey was once California’s capital of the whaling and sardine industry, however, today it's best known for the world-class Monterey Bay Aquarium that presides on Cannery Row. The focus now is on marine education and preservation. Want to experience the bay area first hand? Take a whale watching trip during spring or autumn. In the early evening, cruise along the famous “17-Mile Drive” on your way to Carmel-by-the-Sea. You’ll pass millionaire mansions, Pebble Beach Golf Club and a beautiful rugged coastline along the way. Carmel offers two world-class beaches backed by a small town made up of beautiful homes, quaint streets and fabulous restaurants. The wild and wonderful Point Lobos is just a couple of miles south of Carmel and offers pure beauty that can be enjoyed through the many short hikes. Head south down the iconic Pacific Coast Highway to the southern end of Big Sur. This classic All-American drive is at its most dramatic along this 90 mile stretch of coastal driving. Twisting roads curve around steep cliff faces, passing gorgeous State Parks and spectacular vista points that overlook the vast Pacific Ocean. Cambria is also home to Hearst Castle - the product of one man’s ambition, wealth and imagination. This vast home hosted the rich and famous, today it offers visitors the chance to see fine antiques and art from around the world in an over the top setting. Sequoia National Park and adjacent Kings Canyon National Park's are located in California's southern Sierra Nevada mountains. Drive inland to the Sierras to visit the home of these majestic trees in the Giant Forest. 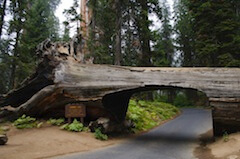 Take a drive through Tunnel Tree and also give "General Sherman" a hug from us. Redwoods as far as eye can see, brimming with history and natural landmarks that take your breath away. The world’s largest tree, affectionately named General Sherman after the American Civil War leader from 1879, stands at 83,8m and is believed to be around 2500 years old. These scintillating trees live in harmony between deep canyons and massive mountains, making Sequoia National Park a land of the giants. Continue north into majestic Yosemite National Park, entering the park from the South gate and Mariposa Grove can be found here. This is the largest Sequoia grove in Yosemite National Park should you wish to see more of the largest living things on earth. Yosemite National Park is over 1,000 square kilometres of nature at it’s very best. The most visited area of the Park is the Valley Floor where you'll find vast rock faces, abundant wildlife, staggering views and stunning waterfalls. Leave enough time to visit Glacier Point, which we believe offers the best views in all Yosemite. Split in half by the California/Nevada state line and completely surrounded by alpine mountains, Lake Tahoe is a wonder to behold. During the winter months classy ski resorts can be enjoyed all around whilst casinos welcome you to the Nevada portions of the shoreline. In the summer you can kayak on the crystal clear waters or relax on one of the beaches. Lake Tahoe is completely surrounded by snow-capped alpine mountains. Be sure to take in some or all of the super scenic 71-mile shoreline drive which surrounds the lake. 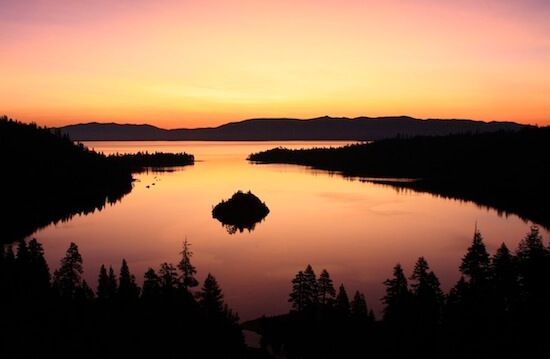 Visit Emerald Bay and it's easy to see why Mark Twain called Lake Tahoe the " fairest picture the whole world affords". You don't have to like wine to enjoy this area. 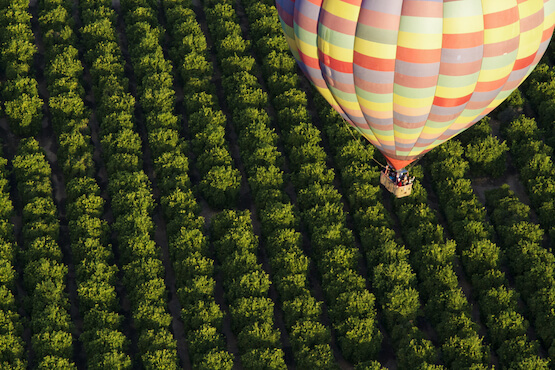 These two neighbouring valleys offer stunning scenery made up of perfectly manicured vineyards stretching across rolling hills that can be enjoyed by car or even on an early morning hot air balloon ride. This is food heaven too, with places like Thomas Keller’s French Laundry and the rather more affordable Gott’s Roadside burger joint. 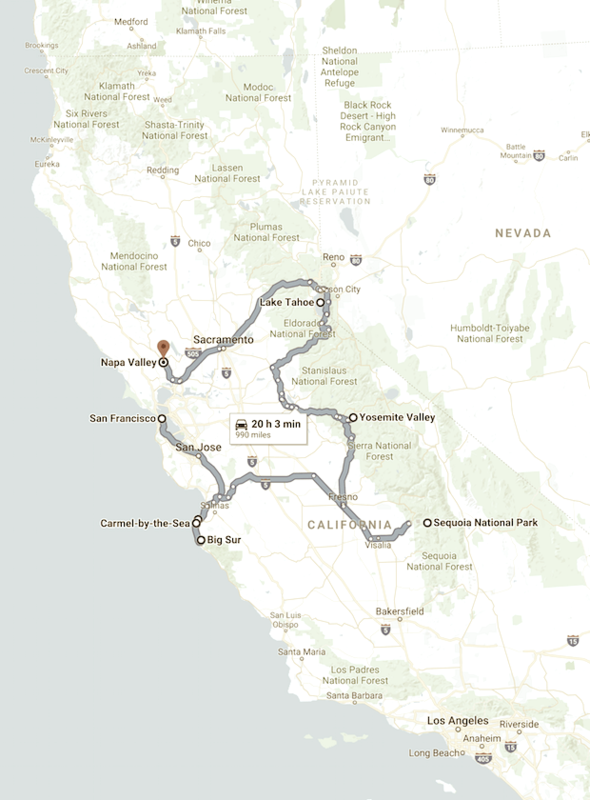 Additionally, you can take a drive along one of our favourite roads in California, The Silverado Trail parallels the St. Helena Highway passing through scenic wine country. The hotels in this area are also a great place to relax before your flight home tomorrow.